Physics and economics are bedeviled by the phenomenon known as “hysteresis”. It’s where, once made, a change can’t be easily undone. In the physical world it applies to breaking an egg. It’s impossible to run the sequence of events backwards - to unscramble the egg. In the world of social policy it applies to extending to the well-off benefits that were previously reserved for the poor. The Baby Bonus is a case in point. By the end of the Hawke/Keating government in 1996 Australia had one of the tightest social security systems in the world. On one estimate 92 per cent of government payments went to the half of the population that earned the least. By the end of the Howard government a decade later many more of the payments were spilling over to the top half. A lesser 87 per cent went to the bottom half. Professor Peter Whiteford of the Australian National University who did the calculations is keen to point out that even after the end of Howard era Australian payments were still the most tightly targeted of the rich nations that make up the Organisation for Economic Co-operation and Development. He ought to know. For many years he was in charge of social policy statistics at the OECD. The Baby Bonus was one of Howard’s most brazen spillovers. Instead of being directed to the parents who had earned the least it was funneled to those who had earned the most. Mothers who had enjoyed high incomes in the year before their child was born were able to claim $2500 per year. Mothers who had been on low incomes got $500. Two years later it became a fairer flat payment of $3000, which later climbed to $5000. But that was as fair as it got. It was paid to millionaires as well as the very poor. No means test, no cut off. Once extended to the well-off it couldn't easily be pried from their hands. Kevin Rudd developed courage in 2008 and denied it to families earning more than $150,000 per year. Late last year as the government’s budget woes worsened it decided to trim the bonus for second and subsequent babies. They were each to attract a payment of $3000 instead of $5000. It was rewarded with a reference to China’s one child policy. "The government seems to want to penalise anyone that has a second or third child," said Coalition Treasury spokesman Joe Hockey. "I think that worked quite well in China, didn't it?" Private Health Insurance Rebate was the Baby Bonus writ large. Overwhelmingly taken up by the middle to high income earners who could afford private health insurance it was budgeted to cost the Howard government $1 billion in its first full year of operation. Thirteen years on it is costing $5 billion per year. The Bureau of Statistics says Australia’s highest earning families (the top 20 per cent) get $16 a week from the rebate. The lowest earners get $5. Labor has hacked away at the rebate since taking office, most recently means testing it so that families earning more than $260,000 get nothing. That high threshold says a lot about how scared it has become about taking away a benefit well-off families should arguably never have received. It’s begun a review of alternative “natural” therapies that attract the rebate with a view to knocking them out. (The Howard government can take credit for earlier knocking out insurance for running shoes, gym memberships and relaxation tapes.) This week the Australian Council of Social Service went further and proposed axing so-called “extras” cover altogether. “Why should the government help fund high-end dental work for people with a chance of affording it, when it doesn’t yet properly fund dental work for people who can’t?” asks ACOSS president Cassandra Goldie. But in assembling $6 billion of proposed savings for the May budget ACOSS has eschewed even bigger measures such as getting rid of the private health insurance rebate in entirety. Meanwhile Labor has been quietly eating away at the rebate’s foundations. Until now it has paid a certain proportion of whatever the health insurance funds have charged. As medical costs have soared (by 7 per cent a year) so have the payouts. But from April next year the payout will only climb by the rate of inflation, typically just 2 to 3 per cent each year. Over time this will mean the government will pay out much less than it would have to families that aren’t particularly needy. A Fairfax analysis suggests that in a decade’s time the government could be paying 30 per cent less. It will have done it without ruffling too many feathers, as it needs to if it is to take away benefits from middle Australia. Labor has done the same sort of thing with pensions. The Howard government made it easier for middle earners to keep at least a part pension by cutting the rate at which the income test took it away from 50 cents in the dollar to 40 cents. Labor has changed it back to 50 cents. The ANU’s Peter Whiteford wants Labor to go further and cut the rate at which the pension increases each six months. At the moment it climbs with male earnings. The next increase, due this month, will be $35 per fortnight. But unemployment benefits increase more slowly, with the consumer price index. It’s been happening for so long that the pension is now 57 per cent bigger than Newstart and climbing. The Henry Tax Review recommended finding a midpoint and increasing both at a rate somewhere in between the consumer price index and wages. “It won’t be popular, but in the long run it’s incredibly important,” Whiteford says. Not being popular is the roadblock facing every attempt to remove a piece of middle class welfare once it is introduced. Richard Denniss of the Australia Institute uses the new insights of behavioural economics to explain why losing a benefit matters far more than gaining one. And the number of middle income Australians with benefits to lose has grown. They are better organised than low income Australians, better able to use the political process and sometimes have entire industries such as superannuation and private health insurance behind them. It took just a week for the Gillard government to back down on a plan floated in January to tax presently untaxed super payouts on balances of more than $1 million. A replacement plan that would more highly tax the earnings of funds held by the top 1 per cent of earners has come under attack on the unlikely ground that it might discourage saving. Treasury calculations suggest the top 1 per cent get an average super tax break of $19,200. Middle earners get $800. Low earners get nothing. 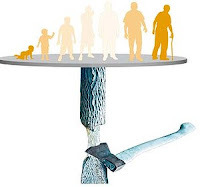 The campaign against taxing super payouts was all the odder because an earlier Howard government measure gave all Australians aged over 65 an effective tax free threshold of $60,000. Even if Labor had taxed super payouts a retiree would need to get $60,000 per year from super before he or she paid a thing. And it makes radical measures unimaginable. Subjecting expensive family homes to the capital gains tax would also be courageous, as would ending the 50 per cent tax holiday for capital gains, neither of which are being pursued by ACOSS. Because middle class welfare is hard to unwind, Labor has been moving slowly and for the most part quietly. Future governments may thank it, but not many people will thank it today. Treasurer Wayne Swan will introduce tougher than expected legislation to crack down on dodgy costings by political parties, extending its reach to the accountants who work for them. The draft bill to be unveiled Thursday will require the Parliamentary Budget Office to seek information from “third parties” employed by political parties in its examination of their costings and will force the parties to furnish the Office with clear lists of their election commitments. The Office will not be given the power to subpoena documents. Flagged by the Treasurer in February the legislation will compel the Office to publish a post-election report on the election commitments of all the political parties 30 days after the vote, including their full impact on the budget bottom line. In cases where political parties contract private accountants to prepare their costings, as the Coalition did in 2010, the Office will be required to seek information from those accounts. The two Perth accountants who signed off on the Coalition’s 2010 policies provided no information other than a one page note saying it was satisfied they were accurately prepared and could be funded. A subsequent examination by the Treasury found errors including double-counting, purporting to spend money from funds already allocated and counting as a benefit interest saved from a privatisation without counting as a cost the dividends that would be forgone. Six near-consecutive interest rate cuts and a share market that’s been climbing since December have broken the back of consumer gloom propelling confidence to heights not seen for years. The March Westpac Melbourne Institute consumer sentiment survey recorded a reading of 110.5 on a scale where 100 means optimists merely balance pessimists. It’s the first time the index has breached 110 since December 2010. 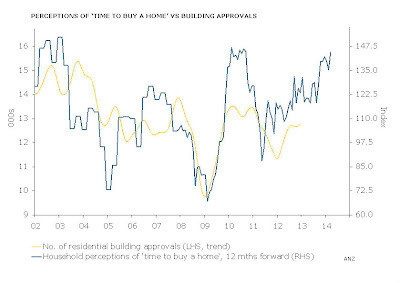 On the all important question of whether now is a good time to buy a house the confidence reading surged to a three and a half year high of 144. 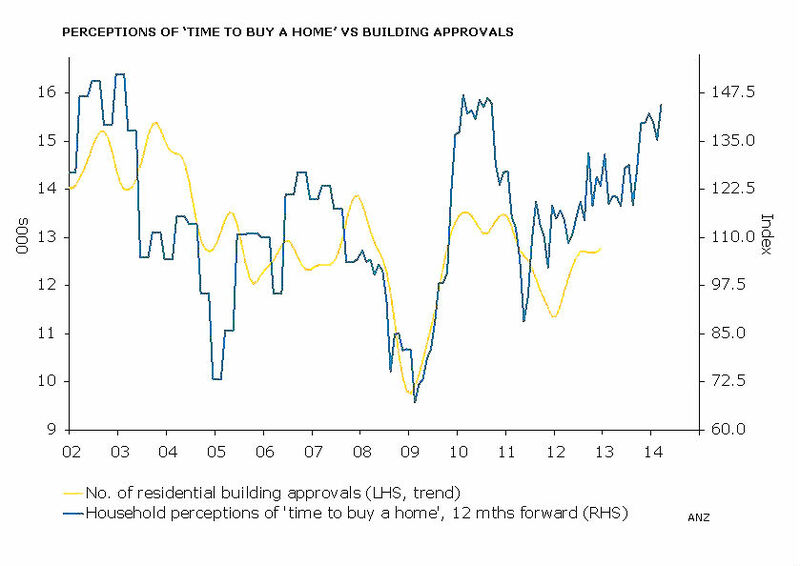 A extraordinary 60 per cent of consumers surveyed believe that now is a good time to buy a dwelling. Only 16 per cent think it is not. Otherwise lacklustre housing finance approval figures released Wednesday show a jump in approvals for investors of 4.4 per cent in January, offsetting a dip of 2 per cent in December. Approvals for investors are up 19 per cent over the year. Australians are also unusually keen to buy cars. An impressive 56 per cent of those surveyed thought that now was a good time to buy a car, compared to only 14 per cent who thought the timing was bad. The proportion believing “paying down debt” was the best use for savings slumped from 23 to 18 per cent. All but one of the questions asked by the Melbourne Institute recorded clearly positive responses. The index for Australians expecting better family finances in the year ahead climbed to 108 from 99 a year earlier. The index for Australians expecting a better economy in the year ahead climbed from 89 to 110. The index for Australians expecting better conditions over the next five years climbed from 93 to 107. The only index not above 100 refereed to family finances over the past year. It climbed from 76 to 87. "The shops." They matter more in Canberra than in other cities. They are not on main roads, they are either in big town centres or the centre of small surburbs, tucked away in the folds of interlaced roads, unfindable if you were wizzing past in a car. The local shops are designed as local centres, close enough to walk to. And we do. They are the focal point of each community. Last night each local shops hosted a "Party at the Shops" to celebrate Canberra's centennary. It was as good as you could imagine. Or maybe you can't imagine, if you haven't lived in Canberra. More than 40 years ago in Ideas for Australian Cities Hugh Stretton outlined the thinking behind Canberra's shops. "The city is built of units, neighborhoods that can support a primary school and a walk-in shopping centre. Three or four of them are grouped to share a larger shopping and service centre. Three or four or five of such groups make a district of 60,000-120,000 people with a major town centre. Any number of these can proliferate around the single metropolitan centre, in a pattern usually called a 'metro-politan cluster'. For communications the Canberra cluster would rely chiefly on a network of roads. From the residential cul-de-sac to the freeways which skirt and link the districts, these roads will be more radically differentiated, safer and-faster than any comparable network in Australia. But the heart of the scheme is not its method of coping with traffic. The heart of the scheme is its use of leasing powers to distribute the city's activities precisely, thus con-trolling the pattern of journeys which the channels have to cope with. For example, for the Canberra population 12 square. feet of shop floor per head is the provision which seems to balance Satisfied customers and prosperous shopkeepers. Each citizen's ration of shop is deliberately distributed 3-1. square feet to the metropolitan centre, 31 to his district centre, 3 to his group centre and 2 to his neighborhood. Some American advisers, used to locating nothing smaller than drive-in supermarkets for no other purpose than retailers' profit, would abolish most of Canberra's neighborhood shops, leaving all the widows and carless housewives to struggle to the super-markets as best they could. But the Canberra planners keep a wary eye on such alien propaganda. They obstinately con-tinue to build the neighborhood centres; and enjoy showing American visitors how they prosper as half their customers arrive on foot and the other half keep their parking spaces as busy as any at the supermarkets. Commercial office needs are similarly predictable, and government and institutional employments are negotiable. The planners put them where they'll prosper best, and. do most good to the town around them. So also with land uses and employments in industry, service trades and higher education. Perhaps private enterprise should complain about this tyranny. In practice most private enterprise revels in it, with what adjustments of its enterprising conscience I don't know. Planning reduces many investors' risks. It need not reduce those that are economically and socially productive — risks with new products, processes, methods. But it reduces the useless risks which arise from uncertain forecasting of other people's land uses. There is nothing efficient about a private enterprise that guesses wrong about the future spread of residence, the build-up of rival or complementary businesses near by, the location and timing of public investment in roads, power, water and sewerage. But in Canberra, if private enterprise bids for a site, it knows exactly when its services will be connected, it knows the customers will be housed around it in predictable numbers by predictable dates, and it knows that a watchful (but reasonably incorruptible) eye will limit the release of competing sites to the number the custom can genuinely nourish. Of course there are policy problems. Producers and consumers sometimes have contrary interests in the level of competition. There are novel business projects for which it is sometimes difficult to provide appropriate land fairly by public auction. In time there will be problems of re-use and redevelopment. So far these problems have been solved in Canberra without impeding innovation — except objectionable innovations, impeded deliberately. Consumers sometimes complain — there's not much chance for any cheap-jack, wild-cat, road-side or tin-shed competition. But the degree of 'producer protection' is no more than a mild case of the general bias of Australian policies towards protected production and employment, at some cost to consumers where ther necessary." Thank you Hugh. Thank you Canberra's founders. How well do home‐owners know the value of their homes? Our homes are worth less than we think, around $100 billion less Australia-wide. New research published in the Australian Economic Review finds Australians typically overestimate the value of their homes by 2.5 per cent. The ones who do it the most are young, living in so-called McMansions on the fringes of Sydney, Brisbane and Perth. Daniel Melser, a senior economist at Moody's Analytics conducted the research while at the University of Technology Sydney. Dr Melser examined the results of a regular survey about estimates of household wealth and compared them to the prices the people being questioned had actually paid for their houses, adjusted for price growth. The owners of big homes (with four or more bedrooms) were by far the most optimistic, typically thinking their homes were worth 5.3 per cent more than they were. Big houses tend to be further away from city centres, worth less to buyers than they are to the people who live in them. Older Australians more likely than young Australians to realistically value their homes, perhaps even undervaluing them, Dr Melser says. An Australian aged 30 is likely to value a house at around 6.6 per cent more than an Australian aged 70. The Reserve Bank believes Australia’s mining investment boom will last longer than it had thought, ending in something more like a plateau than a peak. But it thinks the outlook is highly uncertain and it is on standby to cut interest rates again as soon as is needed. Last week’s ABS capital expenditure survey played an important role at Tuesday’s Melbourne board meeting, persuading members the mining investment boom was not as weak as had been thought and suggesting non-mining investment might pick up in the second half of the year. But with so few mining companies involved in the big decisions and with much that could go wrong, the Bank isn’t placing much store on investment forecasts. In a statement released the meeting Governor Glenn Stevens said said the four rate cuts delivered last year were “starting to have some of the desired effects”. Consumer spending was growing moderately, and homebuilding and house prices were climbing. Holding the economy back were constrained government spending and an exchange rate “higher than might have been expected”. While low inflation gave the Bank “scope to ease policy further should that be necessary” there was not yet a big enough threat to economic growth to justify a further move. The Bank expects its earlier cuts to continue to stimulate the economy for some months. She gets the money from where? It’s as audacious as a raid could be. In order to find $100 million to extend dam walls in Sydney and Brisbane the Gillard government is raiding the equivalent of its coffee jar. Even better, it’s taking out more than it needs - $150 million, directing the extra $50 million to cutting its deficit. Who could possibly complain? “A whole lot of suits in Switzerland” is how one government source puts it. After the September 11 US terrorist attacks in 2001 the Howard rammed through the Terrorism Insurance Act. Australian insurers were refusing to insure big city buildings against the same sort of attack here. The Act forced them to offer the insurance and forced them to contribute to a newly established Australian Reinsurance Pool Corporation which would meet the claims. Backed by an Australian government guarantee of $10 billion, the Corporation has been also been spending buying international insurance, spending for $75 million per year. No more. Its $75 million per year contributions will stop for at least two years. Instead they’ll be paid to government as extra dividends (on top of a special dividend announced in the last budget). It’ll bank $25 million per year and spend $50 per year on worthwhile projects such as extending dam walls. The Insurance Council of Australia won’t complain. It welcomes the spending because it’ll make it easier to insure homes at risk of flooding. “It will certainly reduce the upward pressure on premiums, but we also expect them to go down in areas where there has been a major flood risk,” said chief executive Rob Whelan Thursday. Looked at another way it’s a heist from the the CBD (which houses the buildings at risk of terrorist attack) to the suburbs at risk from the Warragamba Dam. It’s sneaky, its popular, and it’ll save money.